The artist will be at our gallery on Oct 28 and Nov 11. Yoshimi Arts is pleased to present “MINAKO NISHIYAMA / wall works”. 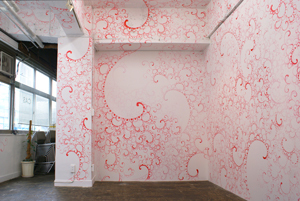 Nishiyama will recreate the mural pieces she has made in various locations in the gallery space of Yoshimi Arts. 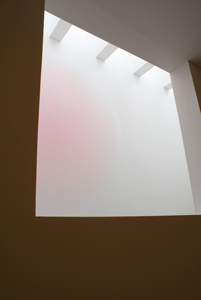 When she first created the two vague, pink mountains on the wall, the fact that she had to squint to make out the image made her wonder for a moment whether this was substantial as a work. These colors, which barely register in our perceptions, trigger optical illusions of the other side that even bewitches the position of the viewer. 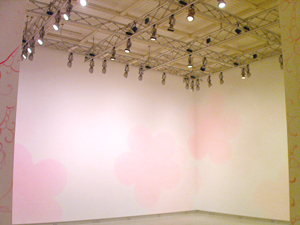 The "wall works", mural works shown in the exhibition, are ephemeral, and their life is limited to the three-week duration of the show. A fleeting life that will disappear thereafter.